Recently, I posted an analysis of animal rights extremism in the UK, USA, Italy, Germany, Mexico and Sweden. By looking at the number of Animal rights activities annually over a 3 month period I described in a drop in the number of illegal incidents in the UK. The UK had the highest levels of activism (average of 24 incidents/quarter) although a massive crackdown on extremism by UK authorities is probably a major part of the decline which has seen only 8 incidents in the July-Sept period for 2010 and 2011 combined. This is certainly promising news for biomedical research in the United Kingdom. See more about activism in Britain in the UK Experience page. 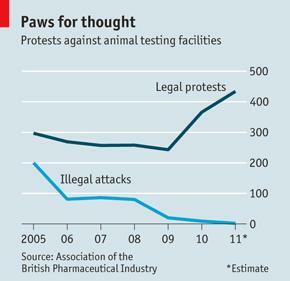 The number of peaceful protests against institutions that perform research on animals has increased markedly of late (see chart), as memories of the violent attacks on the homes and cars of researchers have faded, according to information supplied by members of the Association of the British Pharmaceutical Industry, a lobby group that keeps tabs on such matters. It reckons that many moderate protesters were so appalled at the increasingly abhorrent tactics used by extremists—which culminated in a grave-robbing in 2004—that they abandoned the cause. Only after such attacks had all but halted in 2009 did they return to the barricades. Organizations such as NETCU – the National Extremism Tactical Coordination Unit – have been effective at curbing animal rights extremism, but were not designed to win the hearts and minds of people to prevent the spread of animal rights ethics. It is crucial that researchers continue to reinforce the link between animal testing and the medical benefits derived from it. Professor Morris is unapologetic. “There is a lot you can do without animals. Most scientists who use animals do so as part of a whole portfolio of techniques, which will include work with isolated molecules and genes, building up to whole cells growing on plastic dishes in tissue culture to study the more complex integration of cells to work together as a single tissue,” he says. Some 90 per cent of his staff’s work is done with individual molecules and cells in culture. Posted on October 24, 2011 April 14, 2014 by EditorPosted in Animal Rights News, NewsTagged animal rights, animal rights activism, animal testing, extremism, the Economist, The Independent, trends, uk. I definitely agree with you on the role of NETCU and I didn’t mean to imply that was their job. I’m not sure it’s the responsibility of NETCU or any other police agency to “win hearts and minds” for any platform, however worthy that platform may be. The police should stick to preventing illegal protests, and leave changing minds to civil society groups such as Speaking of Research and the People’s Petition. Researchers, activists, and lobbyists in favour of scientific research should not receive any special treatment or assistance from the police, just because they are in the right – they should be able to make their own case! It’s odd that the Economist article attributes the post-2000 increase in the number of animals used in experiments to the use of GM animals (though this is certainly a factor) but doesn’t acknowledge the other key reason for the increase. In 1998, following over a decade of stagnation, the Labour government started to increase the budget for scientific research budget, which eventually doubled over the following decade. Even after adjusting for inflation over that period that equates to a real increase of about 60%, and was the major reason why the campaigning organization “Save British Science” changed its name to the “Campaign for Science and Engineering”. This increase in funding was reflected in the budgets of the MRC and BBSRC, which fund a much of the biological and medical research done in the UK. There were similar increases in the amount of medical research funded by charities. Quite simply, since the end of the 1990’s there has been a large increase in the total amount of medical research undertaken in the UK. While animal research only accounts for a portion of the total amount of medical research done in the UK (about 10-15%), it is a crucial part of the research process that is fully integrated with programs that also use a wide range of other research methods, so it is hardly surprising that the number of animal experiments have also increased in this period. It is hardly surprising that the numbers of animals used in research have gone up when the total amount of medical research done in the UK rose sharply in the same period, even if it seems to have decreased as a proportion of that total.